A one dish delicious dinner that comes together very quickly with a yeast batter. There’s no kneading or rise time for the yeast batter. You can have this pizza style dinner on the table in one hour! I was browsing the Fleischman Yeast site looking for bread recipes when I spotted a sectioned called 1 Dish and decided to check it out. In this section they have everything from breakfast to dinner with desserts thrown in that are a 1 Dish recipe made with a yeast batter. 1 Dish meaning the yeast batter is mixed in a 9 inch deep dish pie plate and then other ingredients are added and baked in a cold oven. I’d never seen anything like it so I decided to try one. 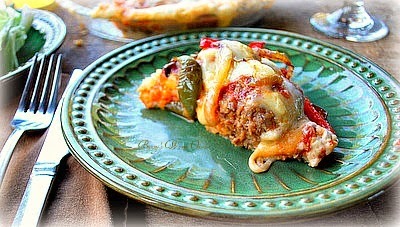 I chose the Italian Meatball and Cheese Pizza Bake. The recipe called for frozen meatballs but I had hamburger to use up so I made my own. My meatballs were bigger than what the recipe called for, next time I’ll use the smaller ones.I don’t have a deep dish pie plate, I used a regular 9 inch pie plate. 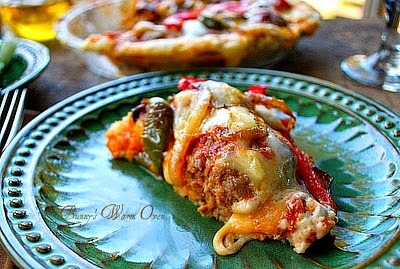 Not a good idea when making this, I had melting cheese coming over the top of the dish, use a 9 inch deep dish pie plate! There’s no kneading or rise time for this batter. As the recipe states you can mix the yeast batter in the pie plate or use a separate bowl. Pat the dough into a greased or sprayed 9 inch deep dish pie plate. Place the meatballs firmly into the dough then top the meatballs with tomato sauce, minced garlic, mozzarella cheese and the herb seasoning. 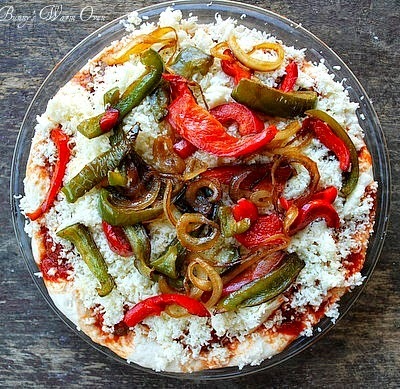 I added sauteed green and red peppers with some onion on top of the cheese, we love our peppers and onions. Put this in a cold oven and turn the temperature to 350 degrees ,the yeast will rise as the temperature in the oven warms. Bake for 30 minutes. Fleischmann’s Yeast also has a video with the recipe you can look at before you make it. It’s very helpful. We absolutely LOVED this dinner! Sorry you can’t see the crust because of the melting gooey cheese, but that’s not a bad thing! I plan on using this recipe to make a Chicken Parmesan 1 Dish Pizza Bake Dinner because this one turned out so well. The 1 Dish section also has dessert recipes, you can bet I’ll be checking those out! Enjoy! BAKE by placing in a COLD oven; set temperature to 350°F. Recipe Note:If desired,batter may be mixed in a separate bowl. Proceed as directed above. This is one comforting dish bunny. Val I was totally surprised how easy and delicious this was! I can’t wait to try another one! You mentioned using chicken. Have you trlied that yet and was it cubed breast or what? Liz, I was thinking Chicken parm-ish so I would use breaded chicken but you could certainly use regular chicken breast. I haven’t done it yet. To say “sorry you can’t see the crust” makes this #mykindapizza!! There’s so much good stuff on top, I love this recipe! Its always #recipemagic when you feel hungry after reading it, and I’m starving! LOL!! Thank you Debbie! It is definitely a keeper!